Start by removing the rubber dust cap from the end of the valve body. The cap is marked "SURFACES BAF 113" around the edge. Be careful when removing the cap because it's not currently being reproduced. I may consider reproducing the cap if there's enough demand for the part. The dust cap seals the proportioning valve assembly. 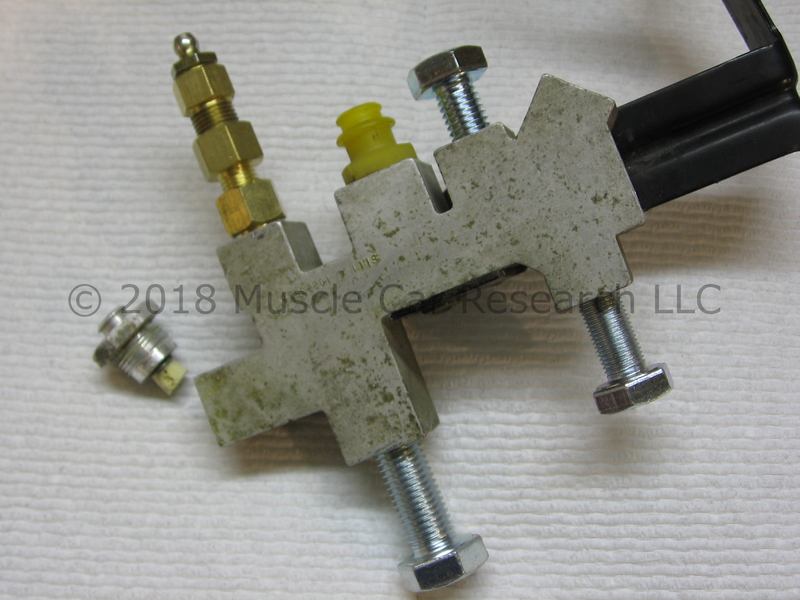 Place the valve in your bench vise and remove the sealing nut slowly with the 19mm wrench so that things don't fly apart when the nut is finally free. Mind the small metal cap the fits between the nut and the end of the piston. Extract the spring and anodized piston. Remove the o-ring from the sealing nut. 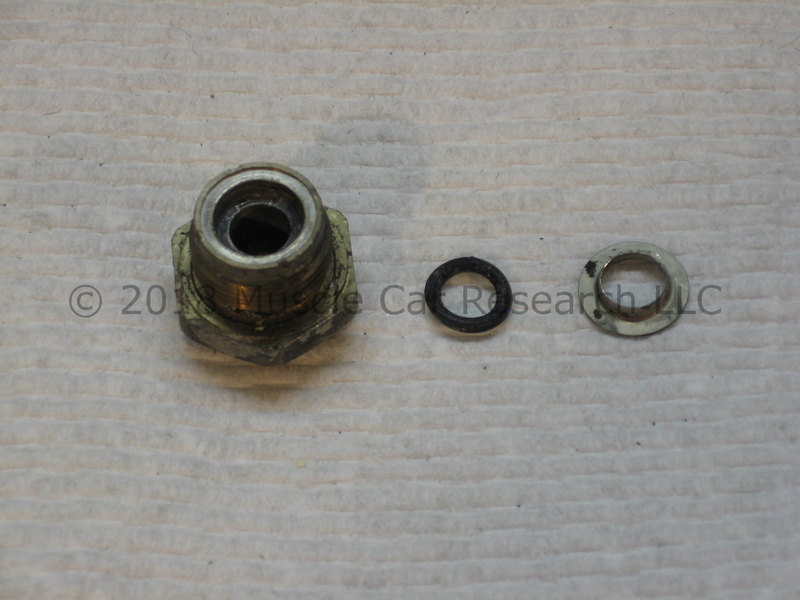 The small metal cap may be loose or it may appear to be stuck to the nut as shown in the picture below. Remove the o-ring from inside the sealing nut using a dental pick. 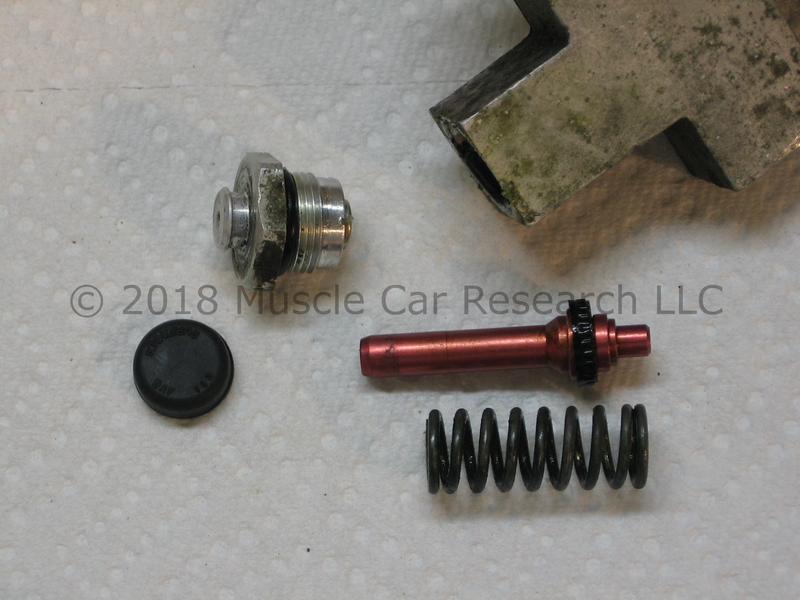 That completes disassembly of the proportioning valve. 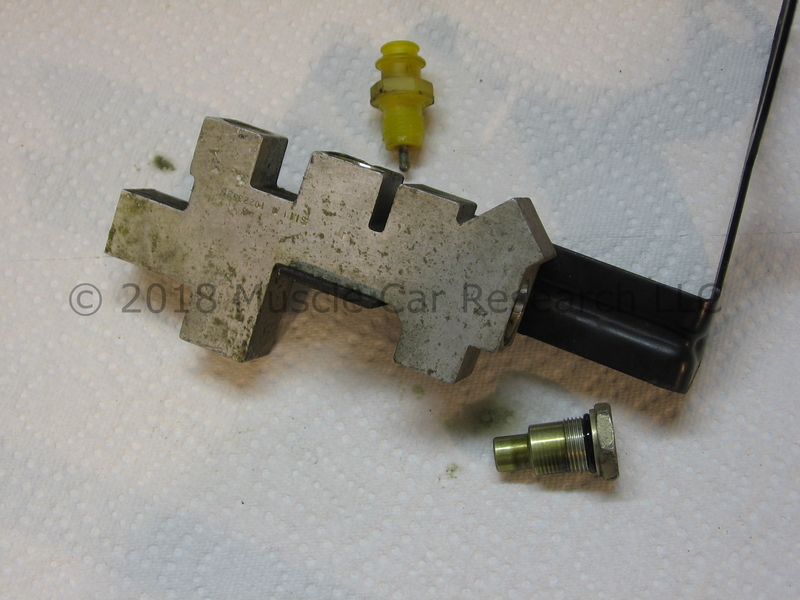 We can now turn our attention to the pressure differential switch. Remove the second sealing nut with the 19mm wrench. Remove the switch terminal with the 5/8" wrench. This next step is the trickiest part of the job. The internal piston needs to be removed, but it can be very difficult to pull it out if it happens to be stuck. You might get lucky by tapping the open end of the valve on your work bench, but if that doesn't work we need to be more creative. A method that usually works for me is to push the piston out using a grease gun to apply hydraulic pressure. 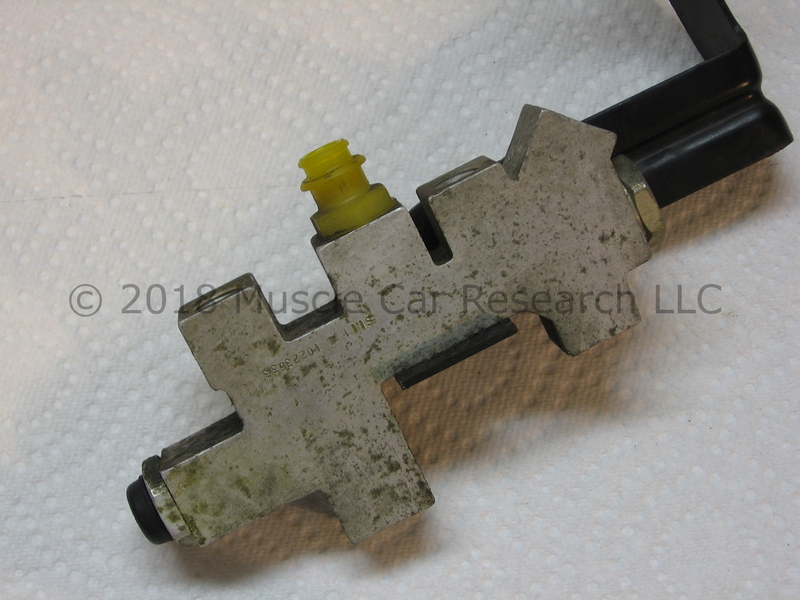 You'll need to block off the fluid ports and combine brake line fitting adapters to accept a zerk fitting. You can block off the pressure differential fluid ports using M11x1.5 and M10x1 bolts. The proportioning valve fluid port can be blocked using a M12x1 bolt. The remaining proportioning valve fluid port uses an M12x1 fitting. The hole in the sealing nut can be blocked using a rubber plug or a small cork plug. I found these bolts and the cork at my local Lowes hardware store. 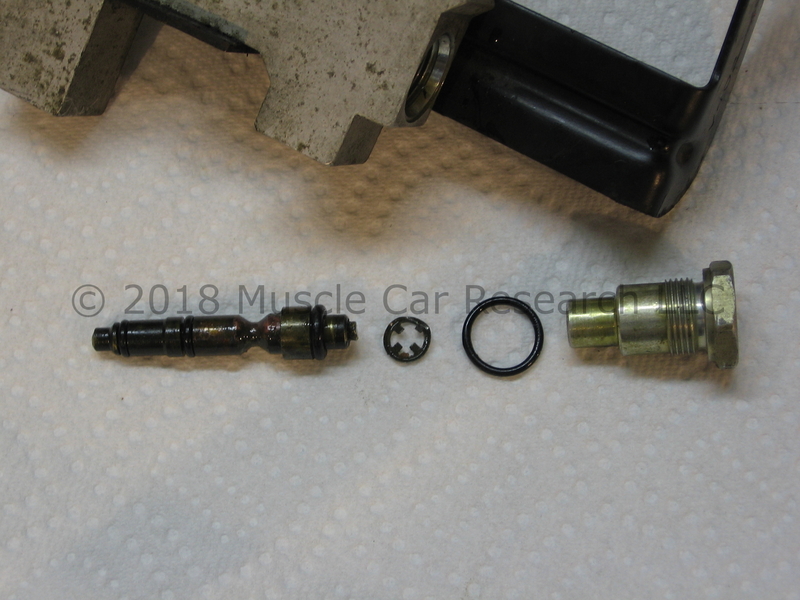 I found an M12x1 adapter at a local auto parts store and worked from that to a zerk fitting. Once everything is sealed up you can attach the grease gun and start pumping. It will take a few pumps to fill up the internal passages, and then you'll feel resistance. 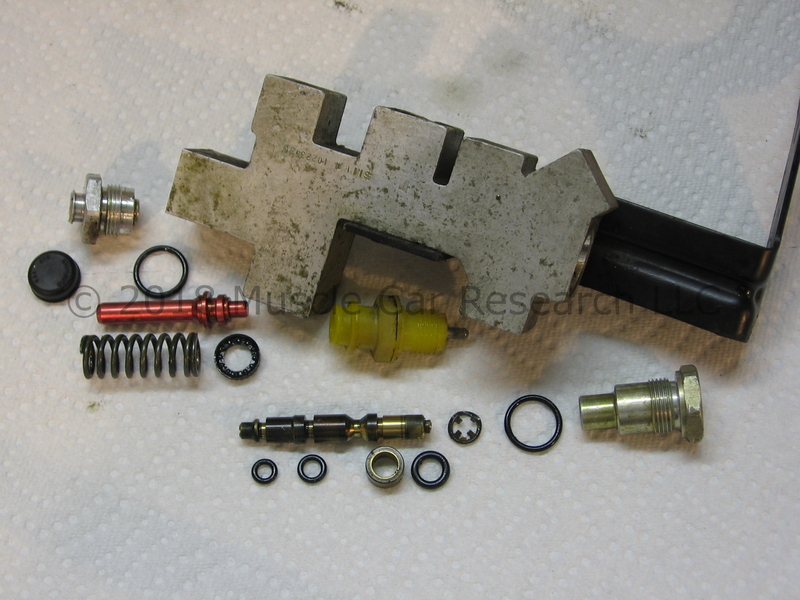 Block off the end of the valve with a rag, give the grease gun another good squeeze, and the piston should pop out. Yes, this makes a big mess! I cleaned this up to make things easier to see. Once the piston is out you'll see a retaining ring on the end. Remove it using a pair of pliers. Remove the o-ring from the sealing nut. Remove the three o-rings and the brass collar from the piston. It may help to use a dental pick to remove the o-rings. 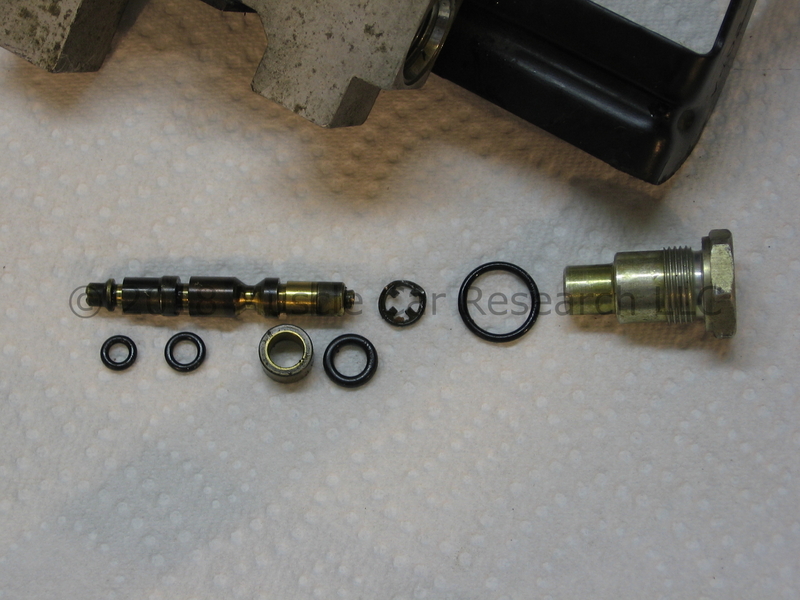 With those last few seals removed your valve is disassembled and ready for cleaning and reassembly! 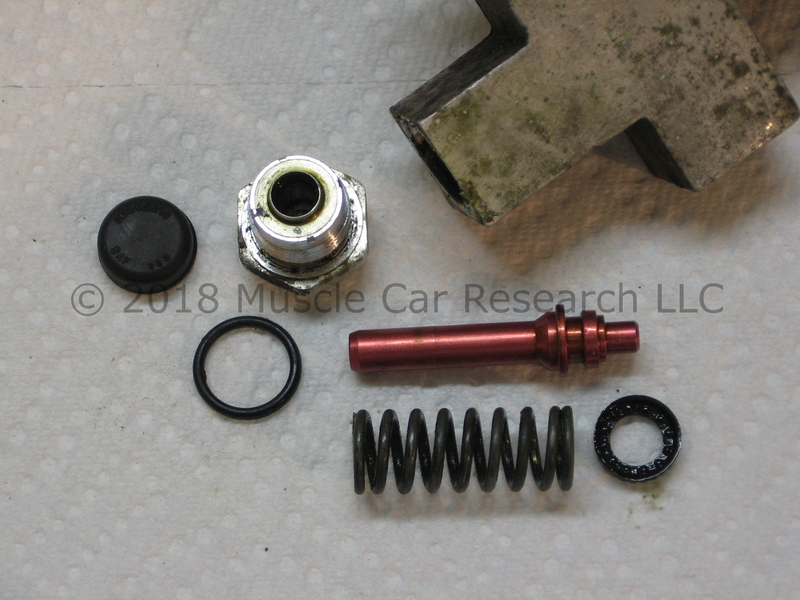 Muscle Car Research will soon offer a rebuild seal kit for this valve. Complete rebuild instructions will soon be available in another technical article.